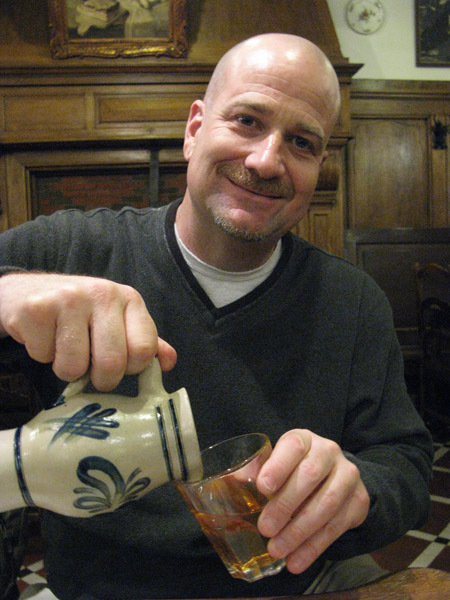 “2010 Kerstbierfestival” is the latest episode of One Pint at a Time. 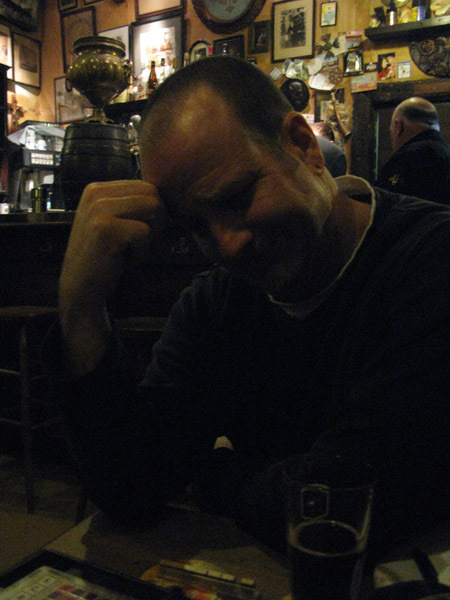 Due to time constraints, the last beergeek.TV episode, Euro Christmas 2010 Part II, used only a part of the footage shot at the Kerstbierfestival. This episode is an extended look at one of our favorite beer festivals. In an era where beer festivals are becoming more and more tests of strength and fortitude, the Kerstbierfestival is a breath of fresh air. When I tell people about the festival, the first thing I say is that you can use your “inside voice” as there is no loud din drowning out conversation. 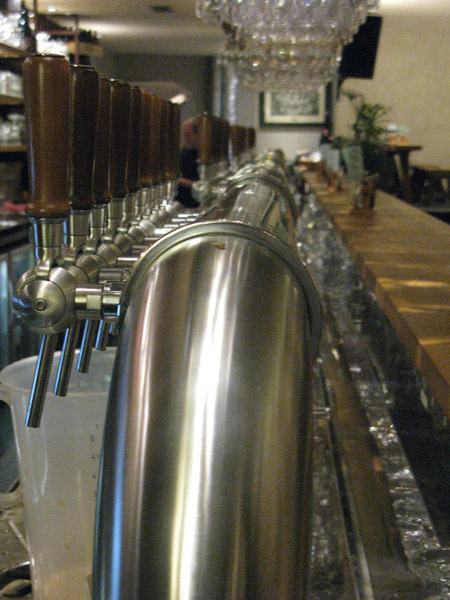 Long lines to get the latest hip beer don’t exist. 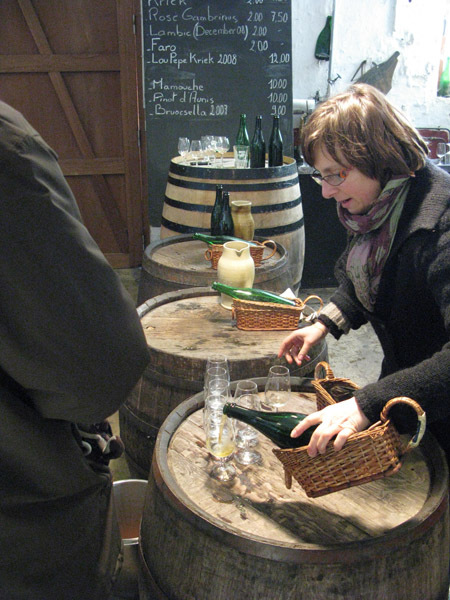 In fact, there are no beer lines to get some of the best, most unique or rarest beers in the world. Truly, the Kerstbierfestival is a gem in our eyes. 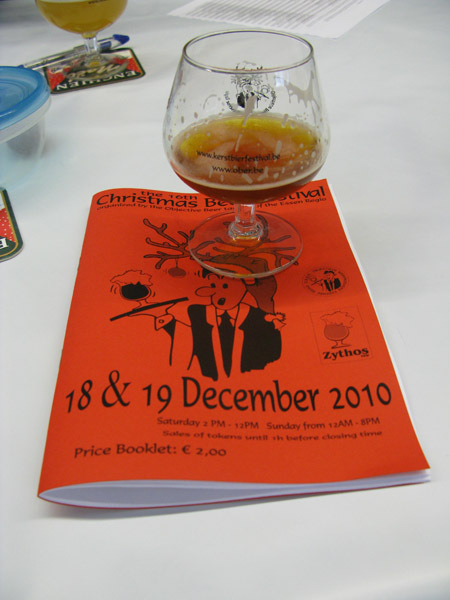 One of our fondest memories of 2008 was the Kerstbierfestival, a Christmas beer festival in Essen, Belgium. 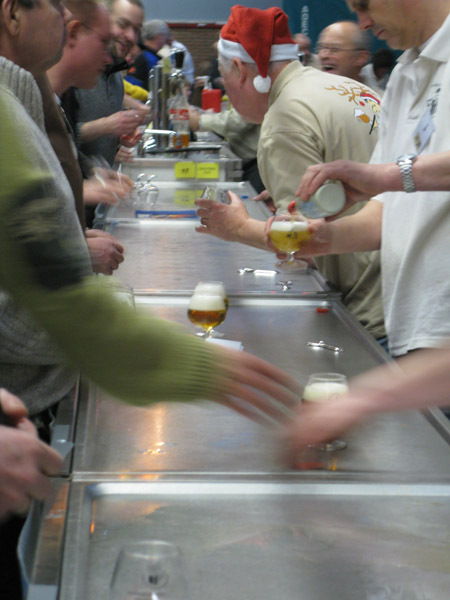 The last two days of the Year in Beer, the festival made quite an impression on us. So much so, that attending on Sunday was more important to us than our goal of reaching 600 breweries on the trip. 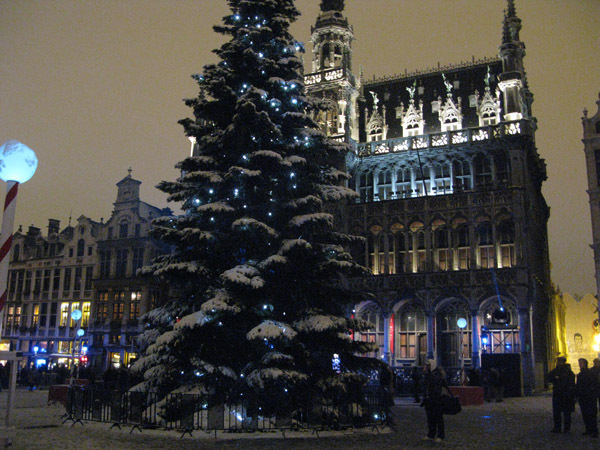 From Brussels, it was an easy, albeit longish, journey to Essen. We just missed a train in Brussels, watching it pull away from the platform as we reached the top of the escalator. 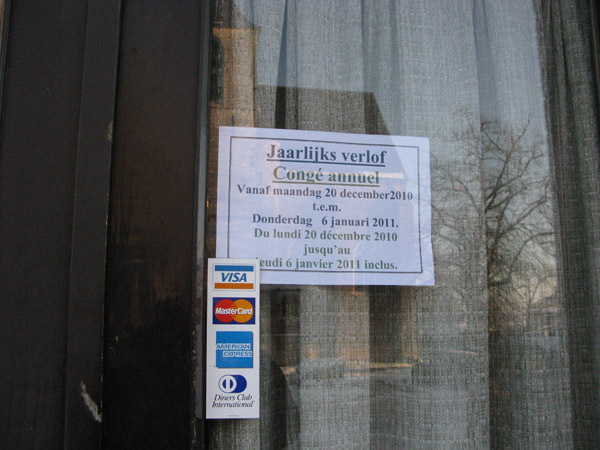 This caused a much longer stopover in Antwerp. By the time, we pulled into the Essen train station, I was busting at the seams with excitement to be back. Two years ago, we walked the almost two kilometers in frigid weather to the festival. This year, with plenty of fresh snow covering the town, we took advantage of a new service of the festival: a shuttle bus from the train station. We, along with another dozen festival goers, were whisked in relative comfort and warmth to the festival. Fifteen minutes after getting off the train, we walked into the Heuvalhal. 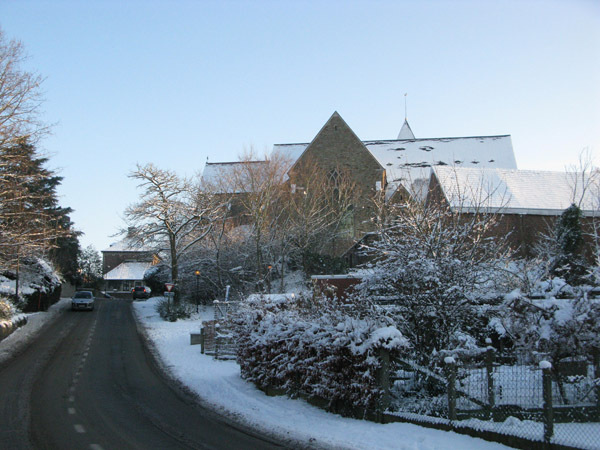 Though it would really pick up later in the afternoon, the hall was sparsely populated when we arrived at half past one. Everything at the festival was just like we left it two years ago. Long rows of tables dominated the gym, broken up only by the token booth set up in the middle. The beer was at the back left of the hall. 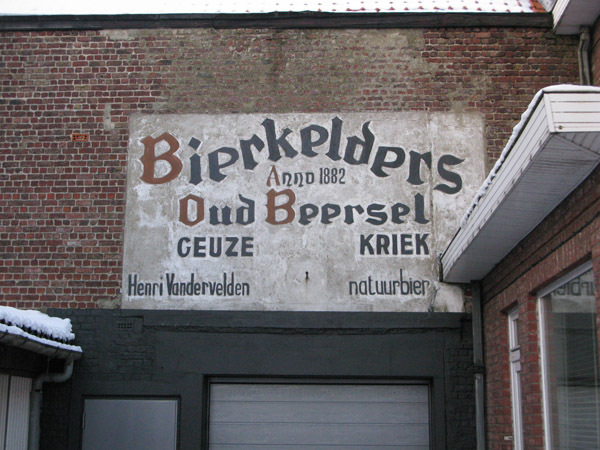 Brewery flags hung from the rafters and local business advertisements adorned the walls. Those already in attendance quietly chatted and sipped their beers. While Merideth found us seats, I purchased our tokens, booklet and tasting glasses. 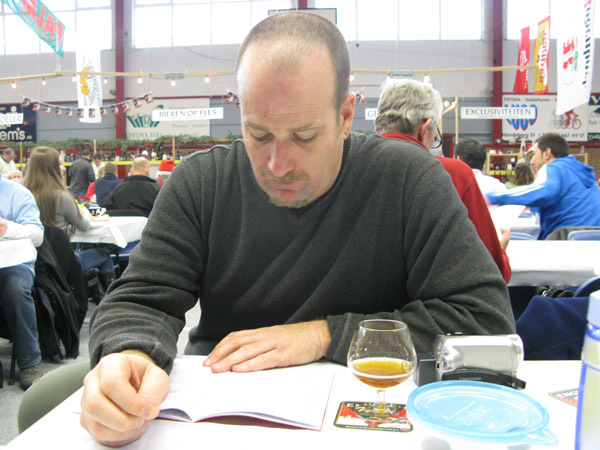 Settled into our seats, we started to flip through the booklet to see what beers to drink. 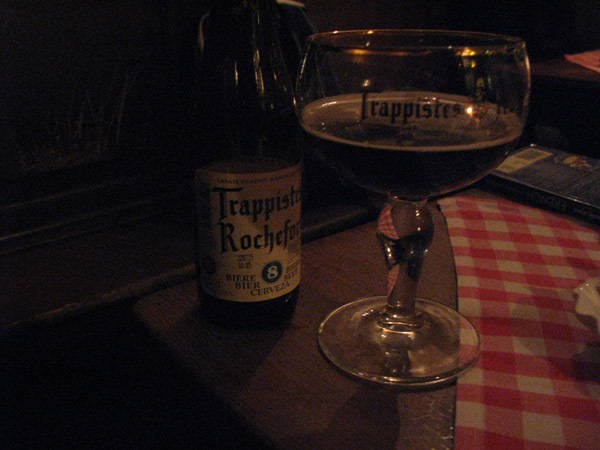 We focused on beers that had ‘rare’ and/or ‘Belgian exclusive’ in it’s listing. 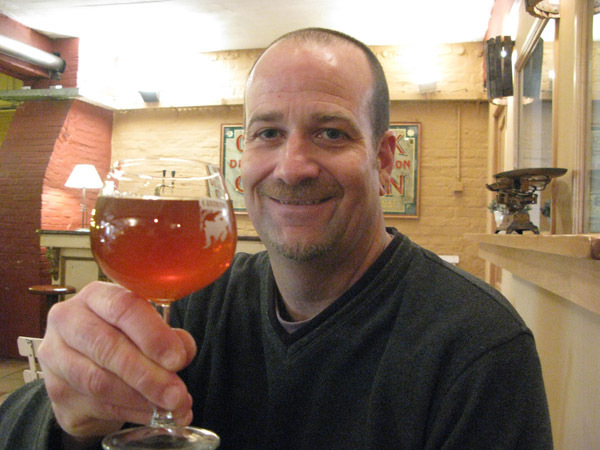 My first beer was a Barleywine, KerstSmiske 2010, a rarity on draft. As usual, Merideth took much longer to decide. The excruciating process was made even longer by some confusion as to whether her first choice was still available. 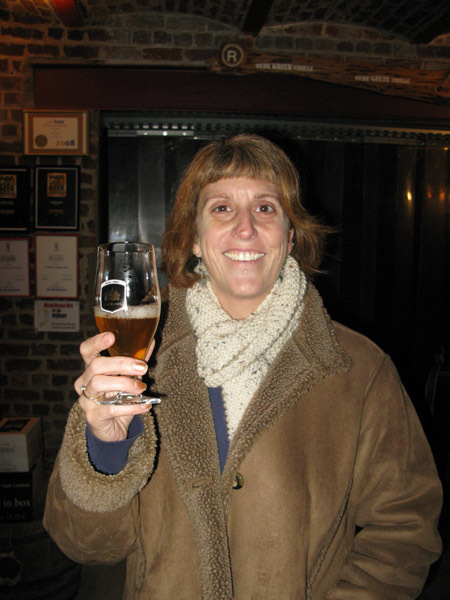 She did end up with her first choice, Blonde de Noël from Brasserie Augrenoise. 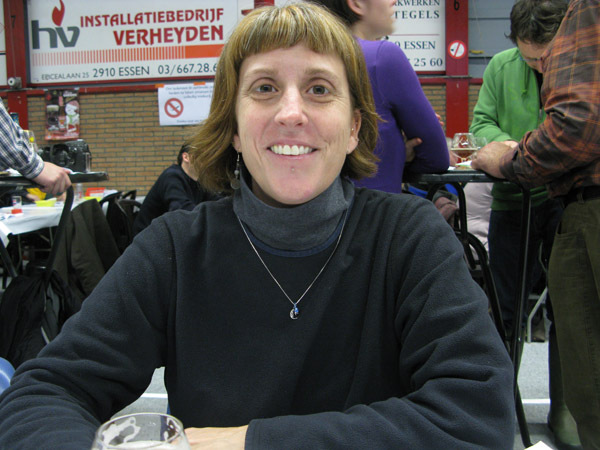 Merideth was drawn to the beer because it was brewed at a home for the mentally handicapped who also help with the packaging of the beer. 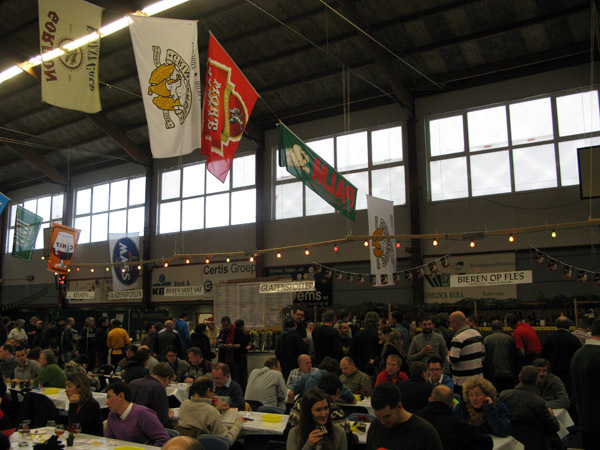 A big draw of the Kerstbierfestival is the amazing beer selection, with 150 or so Christmas beers and winter warmers. But for us, the festival’s real charm is that it is so mellow and relaxing. Unlike many American beer festivals, it’s not a test of strength and fortitude, where you leave with ringing ears and a hoarse voice. Most of the trip, we were constantly on the go. 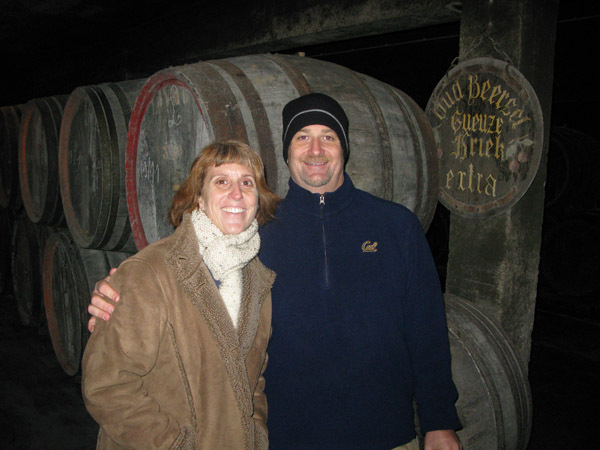 The Kerstbierfestival was our our first real opportunity to slow down and unwind a bit. 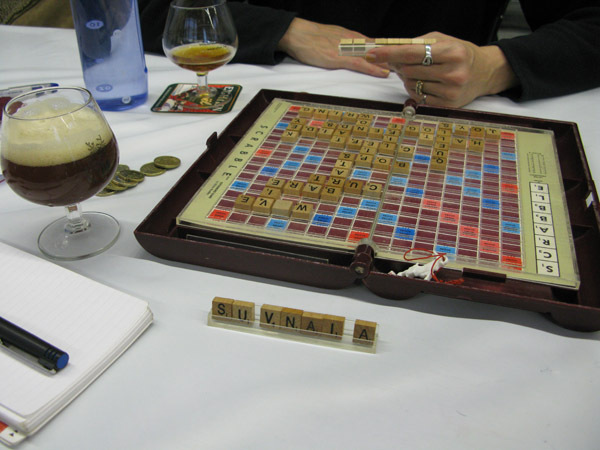 We even found time to play our first game of Scrabble on the trip. All good things must come to an end, however. While it may be a couple more years before we return to the Kerstbierfestival, we will be back. It was snowing pretty heavily as we walked out of the festival and hopped on the bus to take us back to the train station. As the bus negotiated Essen’s snowy streets, we were somewhat nervous and worried. It took us two hours to get out to Essen in good weather. How long would it take to get back with the snow falling? We had a big final day planned and couldn’t afford to get stranded. As luck would have it and much to our relief, we were able to catch an intercity, direct train back to Brussels. 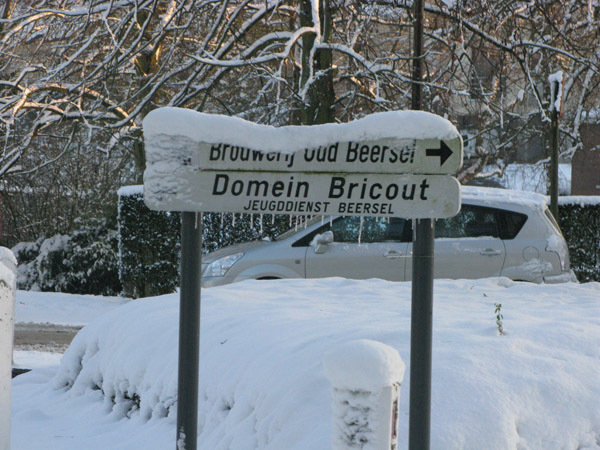 The plan for our journey to Brussels was that we were going to get off the train at Roosendaal to attend the Kerstbierfestival in Essen. After a wonderful time drinking Christmas beers, we would get back on the train to continue our journey to the European capital. I was particularly proud of this plan. We woke up Saturday morning still believing our plan was doable despite the weather. Before we parted the night before, Ferdinand advised us to get to the train station as early as possible. We took this advice to heart and were at Amsterdam Centraal two hours before the departure of the train we intended to take. Chaos reigned at the station. Due to canceled flights and trains, the massive station was jammed with travelers. 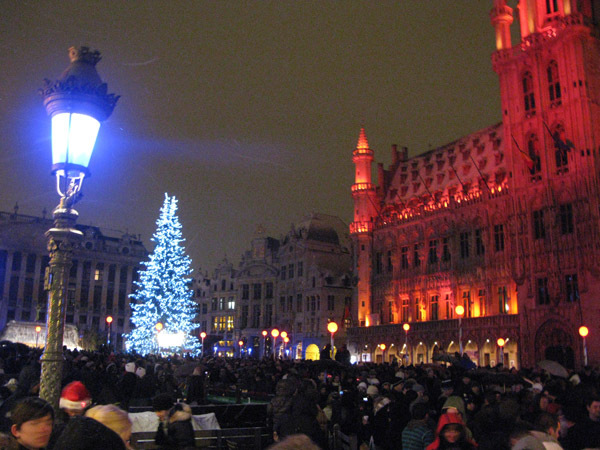 Not realizing how bad it was, I had put off buying tickets to Brussels until we got to the station. Pulling queuing ticket #294, we were shocked to see that they were only on #190. Luckily, there were computer terminals where we could buy tickets online. Tickets in hand, we were up on the platform 50 minutes before our train. 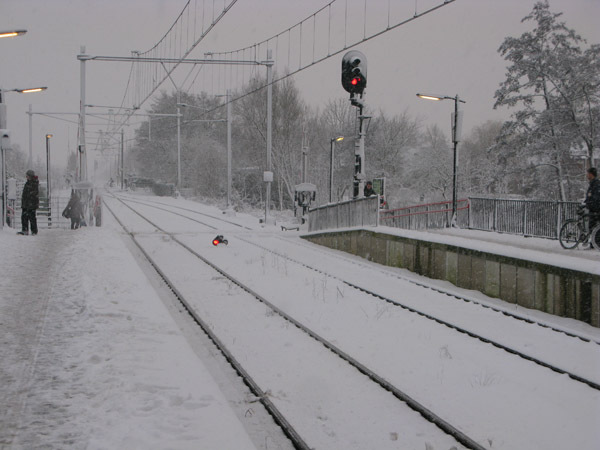 The previous Brussels train was late. Announcements stated that trains were being canceled and the ones that ran would take longer. The longer the delay, the larger the crowd grew on the platform. About forty five minutes into our wait, I was getting nervous about the plan. I said to Merideth, “once we get on a train, I think we should take it all the way to Brussels and pass on the Kerstbierfestival…” It was a hard decision, but Merideth agreed. The train finally arrived. As it was pulling into the station, an announcement was made. There was a track change! Joining hundreds of other travelers, Merideth and I lugged our bags back down the stairs and up the stairs to the new platform and the waiting train. We found two fold down seats in the compartment by the doors and settled in for the journey to Brussels. For almost four hours, we were packed like sardines in the frigid compartment. But we did make it to Brussels. It was late afternoon when we checked into our hotel and were finally ready to hit the town. We really needed a beer but had some time before the restaurant where we were having dinner opened. My bright idea was to head down to Cafe Delerium. When I said we needed a beer, I meant a quiet and relaxing beer to help sooth our stressful day of travel. Admittedly, we have only been to Delerium once, but I don’t remember it being a frat party. Literally as Merideth and I walked in, “We Will Rock You” by Queen blasted from the speakers as the numerous revelers screamed the lyrics at the top of their lungs and pounded the table at appropriate moments. We reversed course. Being close by, we tried Bon Vieux Temps next. Walking down the narrow alley, there was a couple in front of us. 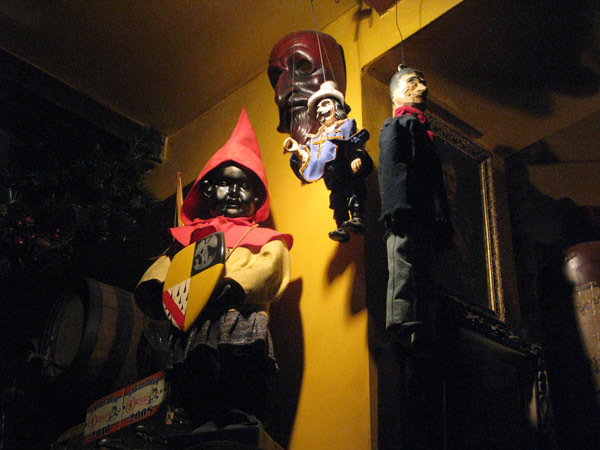 They opened the front door of Bon Vieux Temps, looked in, scoffed and walked away. I assumed the issue was overcrowding but as long as the customers weren’t screaming and pounding rock anthems, I was OK with it to get a beer. Opening the door, we were blocked by a wall of cigarette smoke. It was reminiscent of the Irish pubs we visited before the smoking ban. Repeating the actions of the previous couple, Merideth and I scoffed and left. Giving up on the the idea of a pre-dinner beer, we decided to head over to In t’ Spinnekopke and wait for them to open. 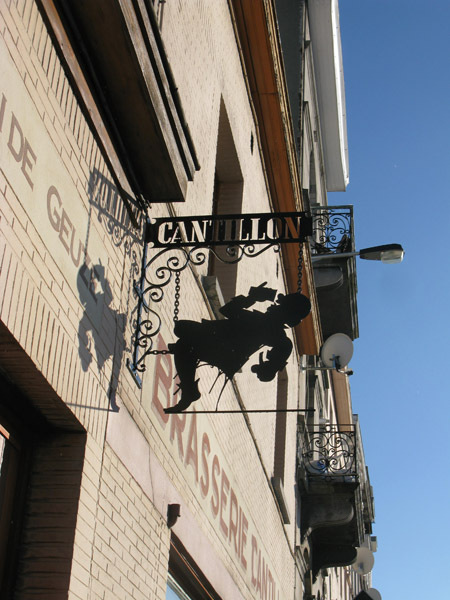 Famous for their beer cuisine, we tried to eat there on our day trip from Paris in 2004. Unfortunately, we needed to return to Paris before they opened. This time, we were the very first customers and were sat at a table at the back of the restaurant. The tiny U-shaped restaurant exuded charm. Complete with tiled floors and red checked table cloths, it looked and felt old, but in a cozy and inviting way. Beer signs adorned the walls in a spartan, dignified fashion. 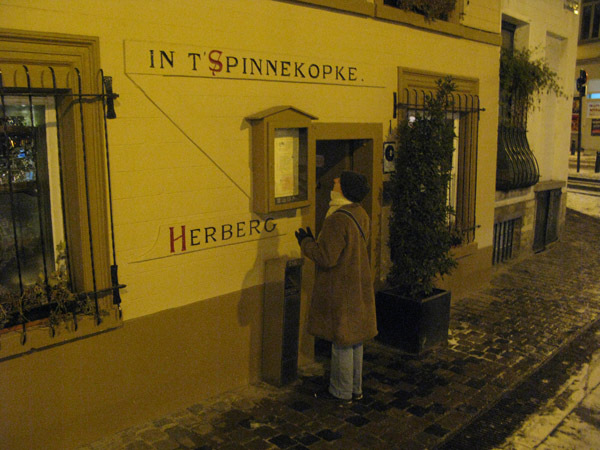 But we were mostly at Spinnekopke for the cuisine à la bière, or at least I was. Merideth surprised both myself and the waiter when she only ordered the croquettes. In her defense, she was getting a cold which was killing her appetite. And she really likes croquettes. Since, we were in Brussels, I eyed the moules for a moment. But the 23 Euro price tag and the fact that I have had bad luck with mussels in Europe, shied me away. 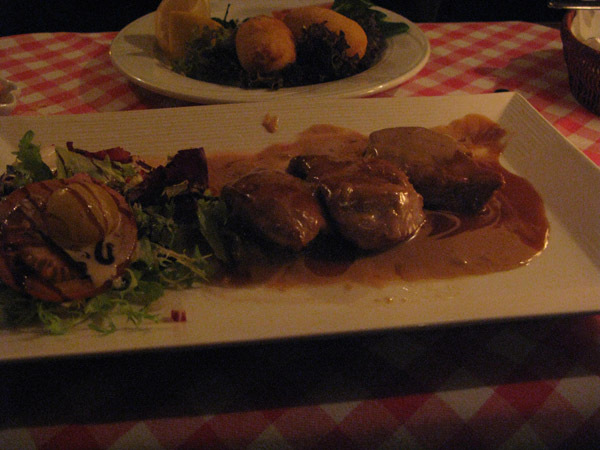 I ended up having the delightfully tasty pork with a Carolus sauce, possibly my favorite meal of the trip. It was time for dessert. Merideth and I scanned the dessert menu focusing on anything that said ‘chocolat.’ Suddenly, Merideth saw the beer sorbets, Kriek and Maredsous were on the menu that night. I ordered the Kriek sorbet while Merideth ordered the Maredsous. When they arrived, we swapped one scoop. The Maredsous was really good, the sweet maltiness made a nice dessert. 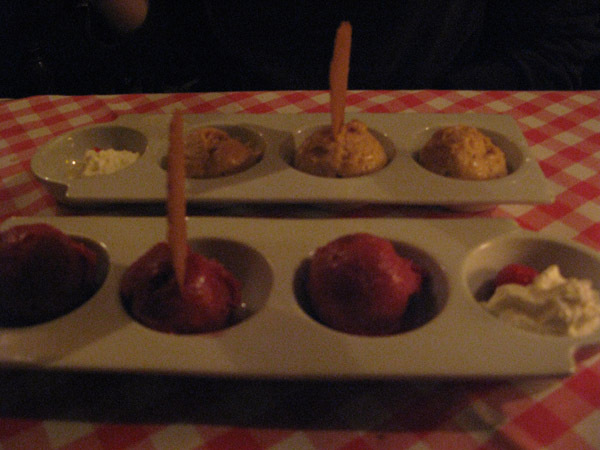 But the Kriek sorbet was absolute heaven especially when paired with the Oud Beersel Oude Kriek. Over dinner, we made our second big decision of the day. The plan for the following day had been to visit a brewery or two in our continued quest to reach 600 by the end of the year. However, we decided to put that goal on the back burner and take the train back out to Essen for the Kerstbierfestival.